I've previously mentioned Jane Grigson's declaration that only "pink" rhubarb is worth eating. She was, of course, referring to the 'forced' kind where the plant is grown under cover of a pot or in the gloom of a candlelit forcing shed. Forced rhubarb is very different from outdoor grown rhubarb and, generally, I have agreed with Jane Grigson's sentiments. Certainly if you are looking for a beautifully evenly coloured compote with delicate flavour it's worth buying the early, forced, kind. However, this growing-year has made me appreciate the merits of the more robust and vigorous form of the plant. A member of the Rheum genus of plants, rhubarb is related to both sorrel and buckwheat. We add sugar to rhubarb to make its natural astringency more palatable and it's easy to forget it's actually a vegetable. In Persian cooking, rhubarb is used in lamb dishes as a tenderiser. In Europe, barely sweetened, it's used as a foil for oily fish like mackerel or fatty meats like pork. In the UK in particular, rhubarb is enjoyed in compotes, crumbles and pies, in much the same way as we use gooseberries. Both share a mouth-puckering sourness before tempering with sugars and flavourings. I felt like the laughing-stock of the allotment group, as the only person unable to get a decent crop of rhubarb. Then, last year, I split the crown of my plant into four sections. Replanting each in a new location has rewarded me this year with a spectacularly good crop. There's nothing so guaranteed to make you appreciate a vegetable as a bumper harvest. So what to do with all that bounty? Personally I find rhubarb releases far too much water to ever make a good pie but, thanks to the Fern Verrow - A year of recipes from a farm and its kitchen, we've been enjoying bowls of Rhubarb custard fool and bottling up Rhubarb cordial for summer's promise of glasses of Rhubarb gin fizz, Pink lemonade and Rhubarb Bellini. But it's a recipe for jam I want to share with you here. 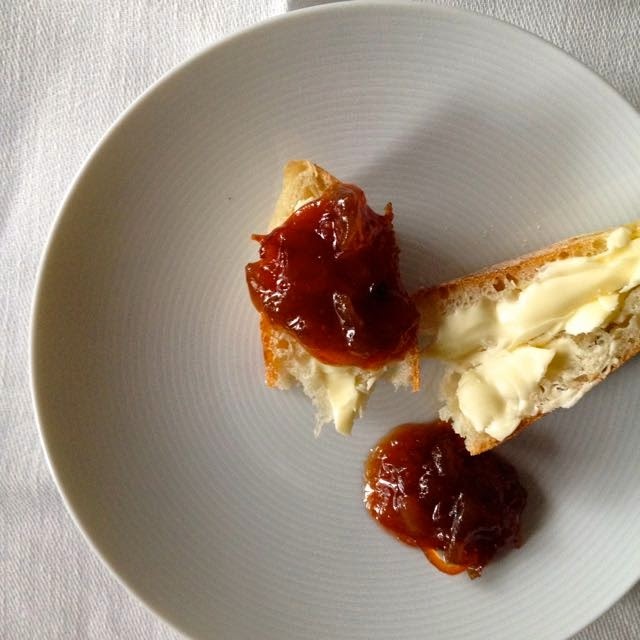 A recipe for Rhubarb Grapefruit Preserve from Alice Waters' Chez Panisse Fruit book (no, not the Chez Panisse Vegetable book). It's not a combination that would normally have caught my attention. Maybe it was because I'm in the midst of reading Bitter by Jennifer McLagan, which goes into the subject of bitter foods in forensic detail. Though grapefruit is clearly a "bitter" food in her view, indeed the fruit was the starting point for her taking on the subject, opinions she sought were divided as to whether the flavour is bitter or merely sour. Personally, I go with bitter and the idea of pairing grapefruit with sour rhubarb seemed a bit of a leap of faith. Maybe it's something about the British palate, as inhabitants of the North American continent seem to have a taste for citrus with their rhubarb. And then I looked at Grigson again - "... with citrus fruits it makes a delightful jam". Sugar can transform the bitterest citrus into delectable marmalade, and the sourest rhubarb into luscious compote, so I swallowed my scepticism and I'm so glad I did. The first time I made this preserve, I took it a degree or two over jam set-point. The colour changed from jewel-like to reddish-brown in the blink of an eye. If this happens to you, what you lose in colour you'll gain in a delicious marmalade quality to the taste. 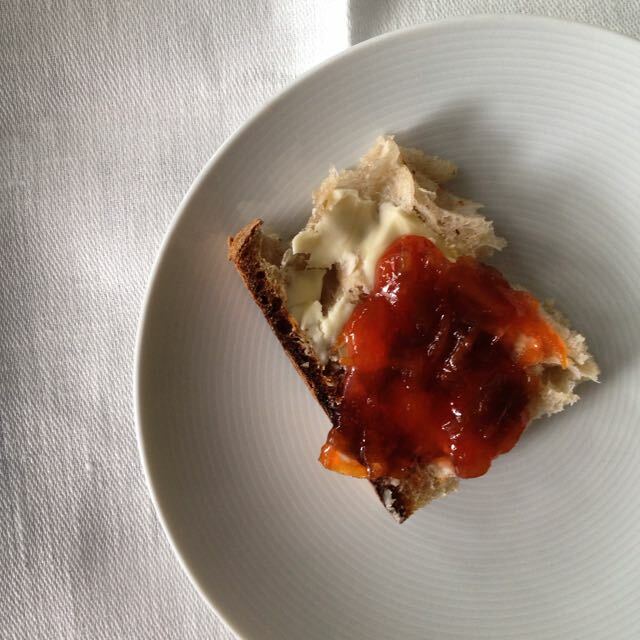 Stopping the cooking at exactly jam set point will give you a ruby-red preserve with the rhubarb flavour to the fore. I'm still not sure which batch I prefer, so really you can't go wrong in my view. Place the rhubarb in a large heavy-based stainless steel pan. Peel the grapefruits, slice the peel thinly and juice the flesh. Add the zest and juice to the pan of rhubarb along with the sugar. 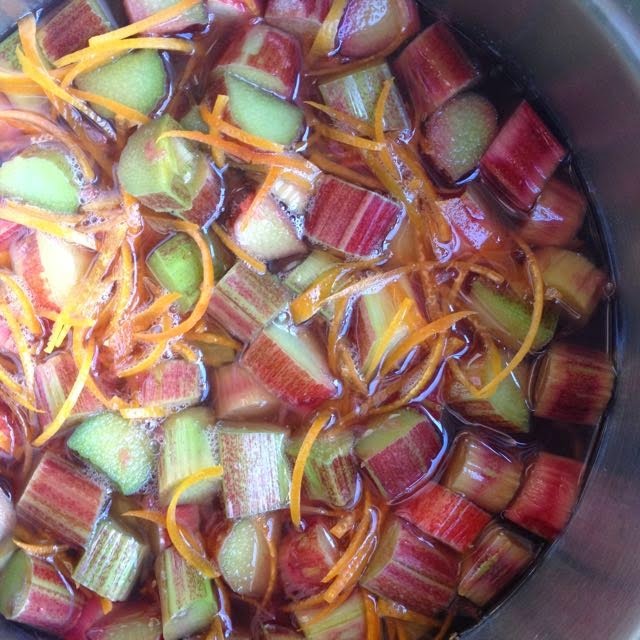 Let the mixture stand for at least 30 minutes for the rhubarb to release its juices and the sugar to dissolve. Sterilise your jars and lids. Put a small plate in the freezer for testing the jam. Over a high heat, bring the pan of mixture to the boil, stirring to make sure it doesn't stick. The mixture will bubble high up the pan. Skim off any foam around the edges. Soon the mixture will subside and bubble thickly. Stir frequently and start testing with a sugar thermometer and/or by using the cold plate for the 'wrinkle' test. When it has reached set point, take the pan off the heat and pot up the jam. Will keep for up to 1 year in properly sterilised jars.